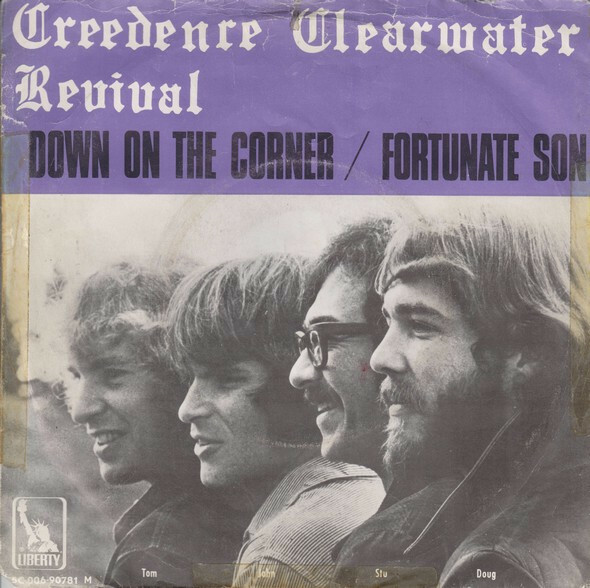 1969 Song of the Day- “Down On The Corner”- Creedence Clearwater Revival. In the late 60’s early 70’s- John Fogerty and Creedence Clearwater Revival were can’t miss. “Down On The Corner” from the groups 4th album- Willy And The Poorboys- peaked at #3 as one side of a double A single- the flip side “Fortunate Son” was at #11 in late November 1969 when Billboard changed the way they ranked double-sided hits. The song is about a fictional band- Willy And The Poor Boys who play on the street corner asking for nickles. On the Ed Sullivan Show in 1969 CCR performed as Willy And The Poor Boys- with Stu Cook playing the gut bass, Doug Clifford the washboard and John Fogerty the Kalamazoo. Over the years the song has been covered by many different artists- from Bo Diddley to-Big Country, Beastie Boys to the beloved Osmond Brothers. Listened to both songs … The Osmond Brothers shouldn’t even have covered it. I hate to include the Osmonds for comic reasons. Such a great groove – like swamp funk.